The road wanderer's best friend (besides the GPS to get home) is the roadside historical marker. More than once, we've been drawn to an interesting story purely by chance, when we've seen one of these signs on a county road or local street. Kinda gives you incentive to drive the speed limit. The title alone gives one pause. 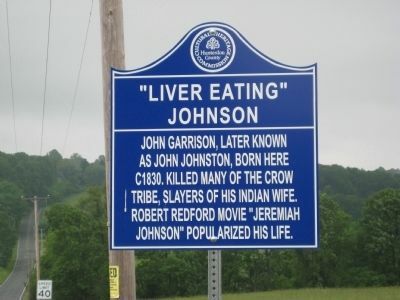 Without reading the rest of the sign, I envisioned a local oddball who made his name by ordering liver every time he went to the local tavern. Maybe he got the name by winning a bet for eating several pounds of liver which, while being very nutritious, isn't everyone's cup of tea. You can read the sign for yourself to get the gist of the story, but it's possibly a little misleading. While Garrison/Johnson was born in Little York (now Alexandria), New Jersey, the deed which led to his sobriquet actually occurred in the American West. I checked into the Johnson story and found several conflicting accounts, all basically pretty revolting. Some say that after a troubled childhood, he left New Jersey to take to the sea, serving in the Navy before venturing west to the frontier. Others say he fought in the Mexican War and enlisted to serve on the Union side in the Civil War. Allegedly, he deserted after striking an officer, which led him to change his name to avoid capture. The liver-eating part is, well, a bit gruesome. According to legend, members of the Crow tribe killed his wife, and in revenge, he took to a 12 year murder rampage. He slaughtered several Crow, eating his victims' livers since the tribe believed that eating the raw liver of the game they hunted would give them added strength. I haven't seen the movie Jeremiah Johnson, but I'm guessing that the cannibalism story line wasn't part of the plot. After all, the title role was played by Robert Redford, not Anthony Hopkins. My research led me to a very well written essay by a young student who refutes the whole 'liver eating' story. That account says that while Johnson was an ornery, belligerent man, he had largely favorable relations with the natives. His nickname apparently originated after a knife fight with attacking Sioux, when a bit of his opponent's liver remained on Johnson's knife after a stabbing. Turning to his companions, Johnson offered the blade and asked if they'd like a bite. That may be callous, but it's not cannibalistic. Johnson lived out his life in classic 1800's Western style, bootlegging whiskey, enforcing the law (while doing the bootlegging, I don't know), prospecting for gold and eventually retreating to a cabin in Montana. He's buried in Cody, Wyoming, far from his Garden State roots. Kinda makes you wonder how many other frontier legends were born in New Jersey. Thanks for posting......the story of Liver Eating Johnston is one of fable, myth, boast and tall tales.....to find the real story one has to dig into the archives of libraries and history societies...not to mention private diaries, news stories and more....he did not have an Indian wife....although one of the privates noted in his diary that Johnston had spent a winter hunting and fur trapping with a native....and she says she was "with Johnston". Johnston denies ever having a wife, living with a woman or being a squawman. Notice in the sign that he killed the Crow. Actually he was friends with, his buddy Tom LeForge was married to Crow woman Cherry, and they were all in a wild west show in 1884. Johnston was noted as being at the Crow Agency slaughters, probably because of his legendary eating. Crow Killer and Mountain Man were fiction books for more reading. Jeremiah Johnson was a grand movie with Robert Redford in 1972. See www.johnlivereatingjohnston.com for general information.